According to a new study by the Pew Internet & American Life Project, the popularity of check-in apps continues to grow, though it still isn’t quite mainstream yet. Pew’s latest survey found that in February 2012, 18% of U.S. smartphone owners over 18 used geosocial check-in apps like Foursquare. That’s up from 12% in May 2011. Even among adults who said they own a feature phone, 11% said they use check-in apps. This means that 10% of U.S. adults (including those who don’t own a cell phone), have now used check-in services at some point in the past. Sadly, the Pew survey did not ask users about how frequently they use these services. Given the hype around these apps in the past, it would be interesting to see how sticky these apps really are. It’s worth noting that the Pew survey’s question specifically mentions Foursquare (and Gowalla in the March 2011 survey), but doesn’t mention Facebook or other services that allow users to share their location in some form or another. I can’t help but wonder if the number wouldn’t be a bit higher if the question had focused less on Foursquare. 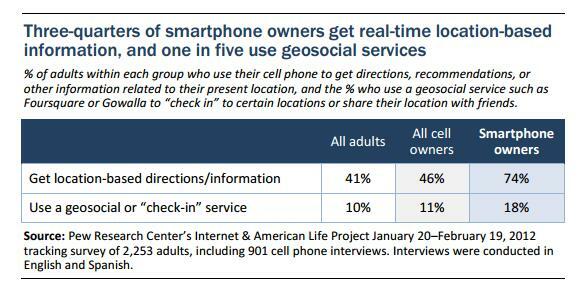 Besides looking at geosocial and check-in services, the Pew study also looked at how often U.S. smartphone owners use their phones to get directions or to get general location-based information like restaurant recommendations. There, the numbers are obviously much higher than those for check-in apps. 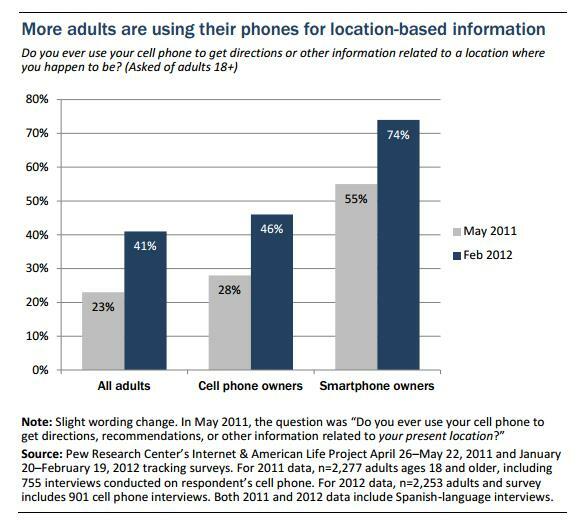 Almost three-quarters of U.S smartphone owners, says the Pew report, now access location-based information from their phones. In a way, it’s actually more surprising that almost 25% of smartphone owners don’t use their phones to get location-based information. Another recent Pew survey, by the way, found that 65% of smartphone owners have used their phones to get turn-by-turn driving directions and 15% do so on a typical day.